Don’t be embarrassed by large, unsightly amplifiers. 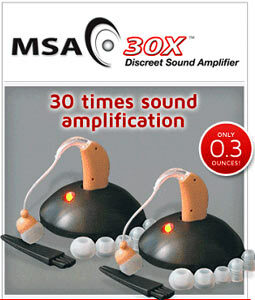 MSA 30X is a discrete sound amplifier that is lightweight and comfortable. The clear tubing of MSA 30X fits the contour of the ear making it almost invisible. Enjoy a movie or show without missing a word, have conversations with friends in a crowded restaurant without struggling to hear them all while being confident in your appearance. MSA 30X is so small it’s barely visible! Lightweight & comfortable - only 0.3 ounces! Rechargeable - no more batteries!